In this article, Marco speaks with Deacons Patrick Toohey and Conor Steadman. A different kind of accent has recently been echoing throughout the corridors of English-speaking Pontifical colleges in Rome, and it is not the British or American accents one may be accustomed to in the eternal city. The accent is Australian, and can be attributed to Deacons Patrick Toohey and Conor Steadman, both formed at St Charles’ Seminary, Guildford, to be ordained priests for the Archdiocese of Perth by Archbishop Timothy Costelloe SDB on 1 August 2015. The two deacons have been privileged to complete part of their religious formation and theological studies in two of Rome’s Pontifical institutions: Patrick at The Pontifical Beda College, a seminary for mature vocations, and Conor at The Pontifical North American College. Reflecting on the significance of having reached this significant milestone in his life, Deacon Patrick commented on the importance of bringing wisdom to, and fostering adult faith in, today’s Church. “My ordination to the priesthood is the culmination of my life and simultaneous fulfilment of it. It is a chance for me to exercise my gifts and to make a contribution through the graces of the Holy Spirit to the building of the kingdom,” Deacon Patrick said. “I pray that I may be an instrument of God and bring my years of maturity, experience and faith enrichment to the Church, particularly in fostering adult faith among the Lord’s sheep,” he added. Following a strong calling in 2007 to study at the University of Notre Dame, Fremantle, and a subsequent study-abroad experience at Boston College, Massachusetts, USA, Deacon Toohey had a chance and providential encounter with College theologian Prof Thomas Groome in 2008 in which he was asked whether he had ever considered the priesthood. After much time spent in contemplation, Deacon Patrick entered St Charles’ Seminary, Guildford in 2010, and was eventually sent by Rector Mgr Kevin Long to the Beda Pontifical College for mature vocations in Rome. While receiving religious formation at a prestigious Pontifical college was undoubtedly a highlight of Deacon Patrick’s travels, it was his work serving the poor with the Rome’s Community of St Egidio that, in his words, “formed me just as much as the Beda College did”. Deacon Toohey’s story brings to the forefront the value of mature vocations – an aspect of the priesthood and religious life whose significant worth is increasingly being discovered by the Catholic Church in Australia. Having entered a minor seminary for a brief period towards the end of his secondary school, Deacon Patrick married, fathered seven children, obtained an annulment and is completing what he has referred to as “a complete circle” in his life by entering into the priesthood. “As mature vocations, we bring our life experiences, maturity and wounds to this ministry – through these, we can help the people entrusted to us. It is difficult to help the wounded if you haven’t been wounded yourself. “We need to smell of sheep, as Pope Francis has been saying recently. To me, it’s about being ‘dinkum’ and allowing Christ to radiate through me. A ‘dinkum alter Christus’ if you like,” Deacon Patrick concluded. Standing alongside Deacon Patrick on 1 August will be another deacon who has benefited from studies in Rome. Born in New Zealand but raised in Australia, Deacon Conor obtained a degree in dentistry from The University of Western Australia and entered St Charles’ Seminary in 2008. From early inquiries about the priesthood at the age of 12, Deacon Conor’s call matured over time and became so central to his life that he left his job as a dentist in Bunbury to properly discern its validity. In 2011, he was sent to Rome by now Emeritus Archbishop of Perth Barry James Hickey to the Pontifical North American College in Rome and to further his theological studies at the Pontifical University of St Thomas Aquinas, also known as The Angelicum. After his ordination to the priesthood, he will be returning to Rome for one year to finish his Licentiate in Moral Theology. “I felt very blessed and grateful to God for my time in Rome. Being at the epicentre of the Church’s history, to be so close to the Holy Father and to the bones of St Peter was a great privilege. “Coming from a more isolated place like Australia, it was insightful to experience other aspects of the Church and hear the experiences of faith from around the world,” Deacon Conor said. Despite having left his career behind to become a priest, the Lord has nonetheless permitted Deacon Conor to put his dentistry skills at the service of those in need. For two years now he has been travelling with a team of surgeons to Saigon, Vietnam, to visit Church and Buddhist-run orphanages to provide dental care. This experience, coupled with the opportunity he was given last Christmas to serve at Midnight Mass for Pope Francis in St Peter’s Basilica, have been two of the most significant high-points in Deacon Conor’s recent life journey. His comments regarding the significance of the upcoming ordination say much about the central role humility must play in his future ministry. “This quite simply is the mission, the vocation, of the priest – to talk about God, to repeat the teachings of Christ the Lord and to administer the sacraments with great love,” Deacon Conor said. 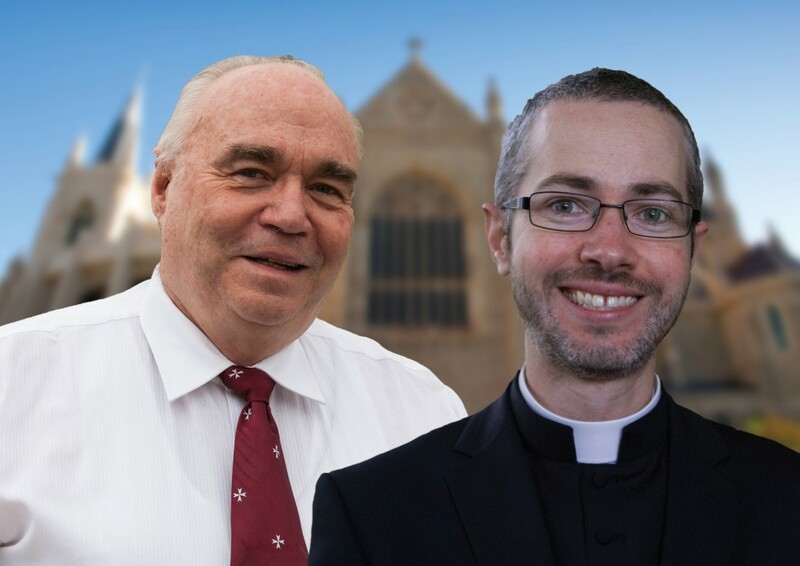 Deacons Patrick and Conor will be ordained to the priesthood by Archbishop Timothy Costelloe SDB at St Mary’s Cathedral, Perth, on 1 August 2015, at 10am.